Quinoa (pronounced KEEN-wah), has been grown in South America for thousands of years. Contrary to popular belief, it is a SEED that is harvested from the goosefoot plant (what a silly plant name!). Although it is a seed, quinoa is prepared and consumed in the same fashion as a grain, so that makes it great as a base, side dish, or porridge – and it cooks fast! 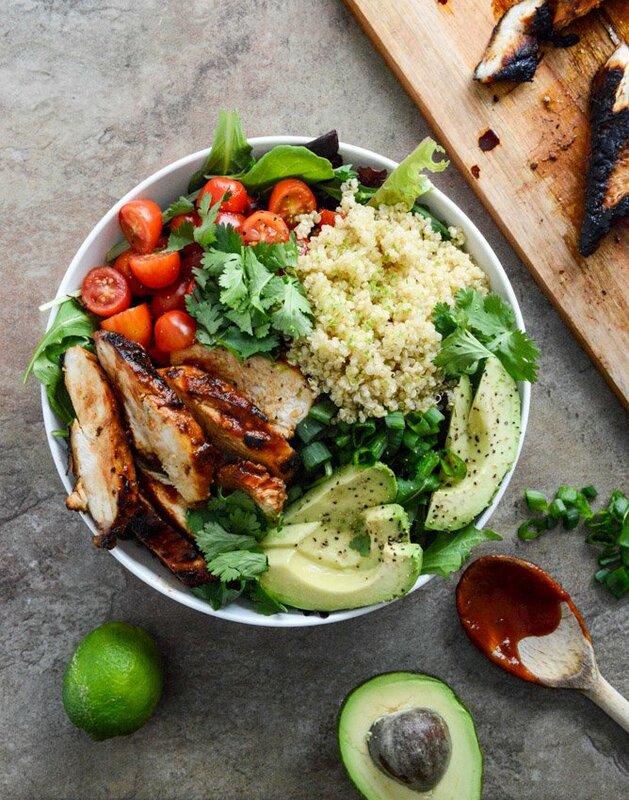 Quinoa has an amazing nutritional profile, providing your body with protein, fiber, zinc, magnesium, manganese, copper, iron, potassium, phosphorus and folate. It contains all nine essential amino acids that your body cannot produce, to make it a complete protein. With 8 grams of protein per cup, it’s great for energy and endurance. FIRST soak it, if you can! This will remove the bitter coating and phytic acid that can bind to minerals in your body and remove them (eek! Don’t fret – just soak, or at least rinse it really well!). Add 1 cup of soaked and/or rinsed quinoa to 2 cups of water in a saucepan and bring to a boil. Once boiling, cover and reduce heat to low to simmer for about 15 minutes until the quinoa is tender and the water has cooked off. To save time, cook a big batch of quinoa (triple or quadruple this recipe!) and use it for several bowls! Quinoa can be used for sweet or savory bowls; breakfast, lunch or dinner. You can even buy pre-cooked quinoa in the freezer section of your grocery store now to save even more time! 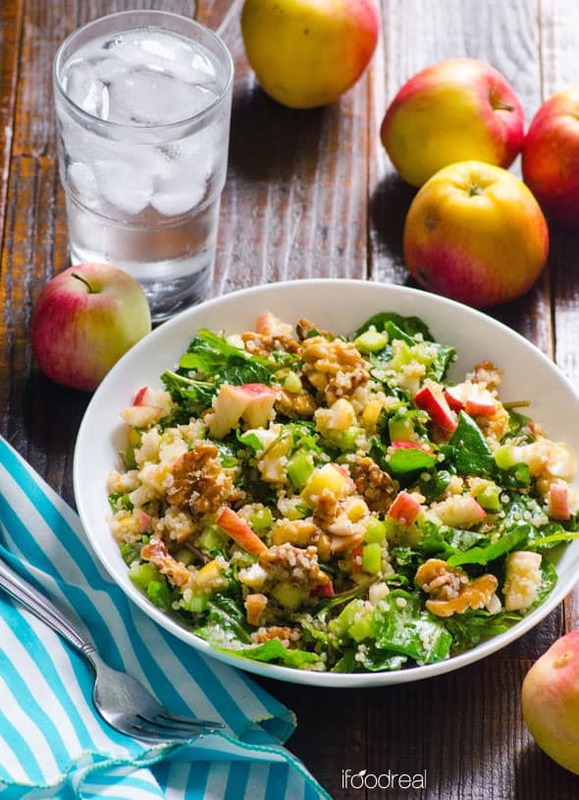 Now that you have the basics, batch cook your quinoa and try some of these delicious recipes! Cook quinoa (instructions on package). Heat a small pan to medium. Add the coconut oil, (onions and garlic if using), mushrooms and tamari. Cook the mushrooms to your liking. I like to cook them for about 7 minutes until they are a bit dark and chewy and full of flavor. If the extra water from the mushrooms doesn't cook off, drain a bit into the sink before you continue with step 4. Stir in the quinoa, spinach, almond milk and nutritional yeast and cook for another 1-2 minutes until the spinach wilts a bit, the milk and yeast have combined nicely and all of the flavors have come together. When you're ready to make the meal, heat a large nonstick skillet over medium-high heat. Add a tiny bit of olive oil and add the chicken, then cover the skillet and cook until the chicken is deeply browned on both sides and cooked in the center, about 6 minutes per side. Cut your sweet potatoes into equal-size wedges or large cubes and transfer them to a baking sheet that has been lined with parchment paper. Drizzle on the olive oil and sprinkle on the cinnamon, paprika and sea salt. Roast for 20-30 minutes or until fork-tender and golden. Add the quinoa and water to a medium sauce pan. Bring the mixture to a boil, reduce heat and simmer for 10-15 minutes or until the quinoa is translucent and tender. Add in the chives, pomegranate seeds, hemp seeds, balsamic vinegar and tamari. Toss to coat. Add the cranberries, maple syrup, water, cinnamon and cardamom to a large sauce pan. Simmer for 15-20 minutes or until the cranberries have burst and broken down into a chunky sauce, stirring occasionally. Let cool and transfer to a glass jar. Prepare the mashed avocado in the morning just before assembling the power bowl. Add the flesh of the avocado to a bowl and squeeze the lime juice over top. Sprinkle on some sea salt and use the back of a fork to mash the avocado. Stir in the chili flakes. 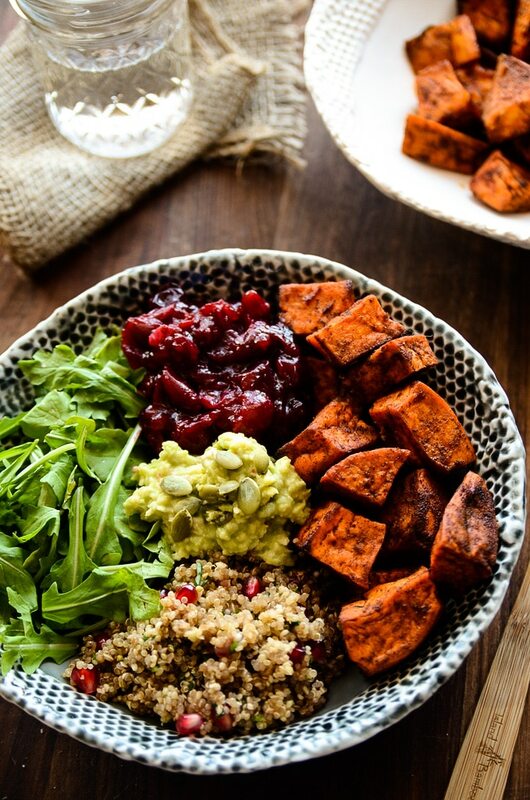 In an airtight container or bowl, add in some sweet potatoes, quinoa, fresh arugula, cranberry sauce and mashed avocado. Garnish with black pepper and a fresh spritz of lime juice. Storage Instructions: Refrigerate salad without the dressing for up to 2 days. Dressing keeps well refrigerated for a few weeks. All dressed salad stays fresh in the fridge for up to 1 day. Combine the quinoa and Almond Breeze in a large pot and bring to a boil. Once boiling, reduce to low heat and cover. Cook until the Almond Breeze is absorbed, about 20 minutes. Fluff with a fork and let the quinoa stand until it comes to room temperature. Place the 2 cups of Almond Breeze into a blender. Add in the blueberries and blend until smooth and creamy. In a small bowl, whisk the honey and remaining Almond Breeze until smooth and well combined. It should be the consistency of a glaze. 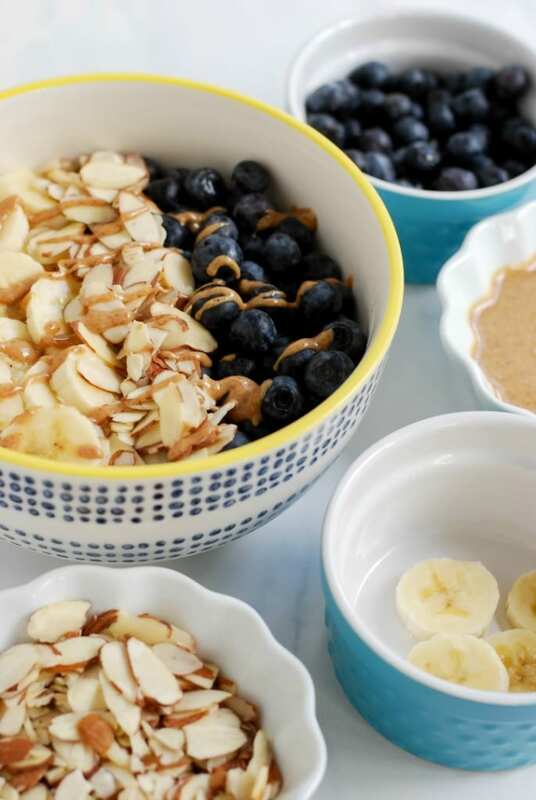 Divide the blueberry smoothie between bowls and top with the quinoa. Drizzle each bowl with the honey glaze, top with toasted almonds and DEVOUR. Preheat the oven to 425 degrees . On a baking sheet, toss sweet potatoes with 1 tablespoon coconut oil and paprika and season with ¼ teaspoon each salt and pepper. Roast until tender, 25 minutes. Meanwhile, in a medium saucepan, bring water and quinoa to a boil. Reduce heat, cover and simmer until liquid is absorbed, 15 minutes. Fluff quinoa with a fork, then transfer to a large bowl; add sweet potatoes and combine. To make vinaigrette, puree olive oil, vinegar, shallot, mustard, thyme and remaining salt and pepper in a blender until smooth. Pour half over quinoa/sweet potato mixture, tossing to coat. 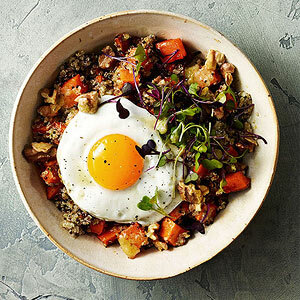 Divide quinoa/sweet potato mixture among four bowls and top with an egg, walnuts and microgreens. Drizzle with remaining vinaigrette. Mix the cooked quinoa with the maple syrup and cinnamon, stir to combine. Heat the quinoa in the microwave or on the stovetop until warm. Divide between two bowls. Add half of the blueberries, banana, almonds and hemp seeds to each bowl. Add any other toppings that you would like! Line 2 baking sheet with parchment or a silpat. In a large bowl add the quinoa, almonds, cashews, sesame seeds and flax seeds. Stir in the honey, coconut oil, vanilla extract, instant coffee and a pinch of salt, mix well. Dump the mixture out over the 2 prepared baking sheets and spread evenly. Bake for 35-50 minutes, stirring every 15 minutes until lightly golden brown all over. Remove from the oven and allow to cool before storing. Mix together the oats, ½ cup coconut milk, chia seeds, vanilla and salt in a small bowl. Cover and place in the fridge for for at least 30 minutes or preferably overnight (now is when I would make the quinoa cereal). The next morning, add the mixture to a blender along with the remaining ½ cup coconut milk and banana. Blend until smooth and creamy. Pour the creamy oats into a bowl. 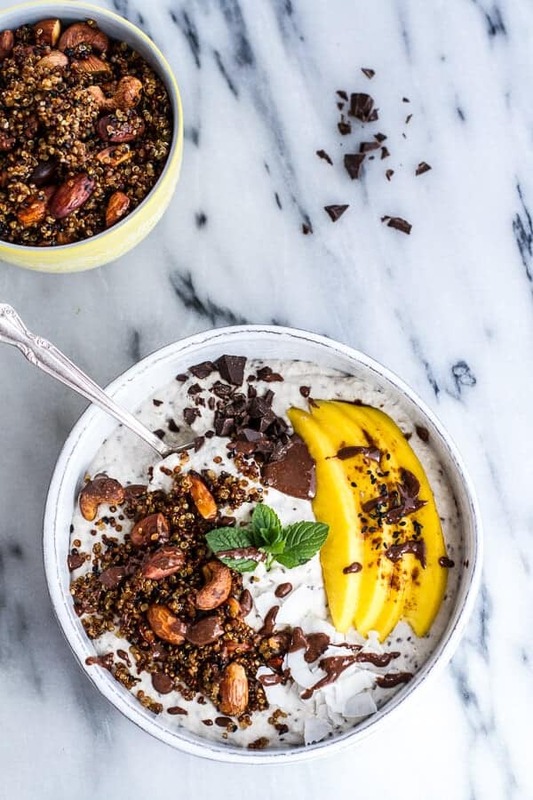 Top with the crunchy quinoa cereal, sliced mango and chopped chocolate. Add some mint and a drizzle of chocolate coconut butter or coconut butter if desired. Eat! Heat the oil in a large skillet over medium heat. Add ginger and garlic and saute for 30 - 60 seconds until fragrant. Add the quinoa and kimchi and cook until hot, about 2 - 3 minutes. Stir in kimchi juice, tamari and hot sauce if using. Turn to low and stir occasionally while you prepare the other ingredients. In a separate skillet, cook the eggs on low until the whites have cooked through but the yolks are still runny, about 3 - 5 minutes. Steam the kale in a separate pot for 30 - 60 seconds until soft. Stir together cooked quinoa, chia seeds, almond (or coconut) milk and vanilla in a medium-sized serving bowl, until combined. Pour mixture into one or two serving dishes. Cover with plastic wrap and refrigerate overnight (or at least 4 hours). Rinse and slice fresh fruit. Combine almond butter and honey in a saucepan or microwave-safe dish. Heat until warm. Top quinoa pudding with fruit, slivered almonds, chocolate (optional) and a drizzle of the almond butter/honey mixture. Fluff the quinoa with a fork. Stir in the salt, vinegar and greens (if you intend to eat this dish as leftovers, I recommend storing leafy greens separate from the quinoa, as the greens don't reheat well). 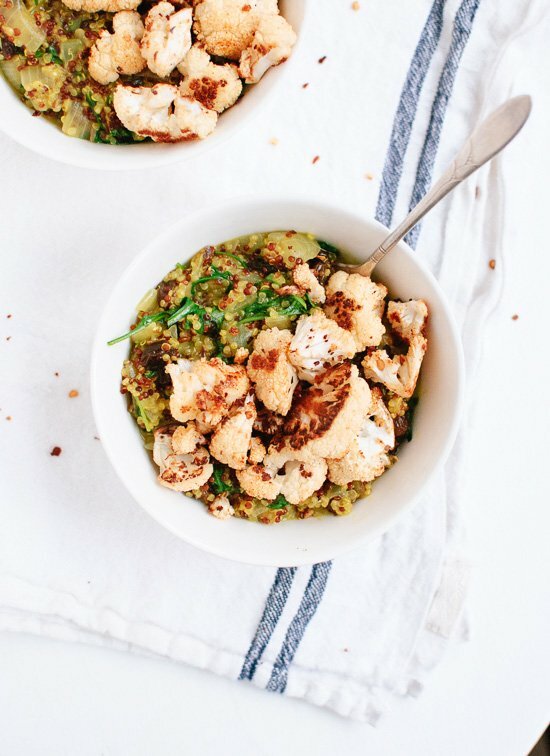 Divide the quinoa into bowls and top with roasted cauliflower. Garnish with green onions and red pepper flakes if you'd like. In a large sauce pan heat 1 teaspoon of olive oil over medium heat. Sauté quinoa, onion and garlic until garlic is fragrant. Slowly add broth and stir. Add cumin, salt and pepper. Stir in 2 tablespoons of tomato sauce. Bring to a low boil, cover and reduce heat to low. Add black beans to sauce pan, gently stir to combine. Serve with diced avocado and pico de gallo.